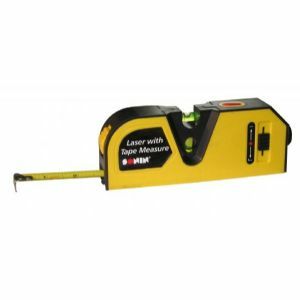 LASER LEVEL w/TAPE MEASURE: Use on floors, walls, doors, or windows to install shelving, light fixtures, wallpaper, tile, pictures, cabinets, crown molding, and more. Convenient slide switch easily changes from laser dot to horizontal or vertical laser line. Built-in horizontal and vertical bubble level for fast and simple level (horizontal) and plumb (vertical). 10-foot (3m) power return tape with blade lock. Convenient hands-free mounting to metal surfaces. Easy-to-use, easy-to-store. Requires two AAA batteries (not included). Shipping Weight: .620 lbs. Shipping Dimensions: 6.75 X 2.75 X 1.6 inches.